Current: Did Hamas Lose Control of the Gaza “Return” Marches along Israel’s Fence? When the Gaza “Return” Marches began in March 2018, Hamas was particularly restrained and kept its distance. Hamas had already learned its lesson from the Return Marches in Syria, which were originally directed toward the border with Israel with government sanction, but as soon as the people went out into the streets, it was not certain if they would march toward the border with Israel. In fact, the Syrian rebellion broke out around the same time. When the opposition to Assad in Daraa saw there were demonstrations, it began demonstrations of its own. 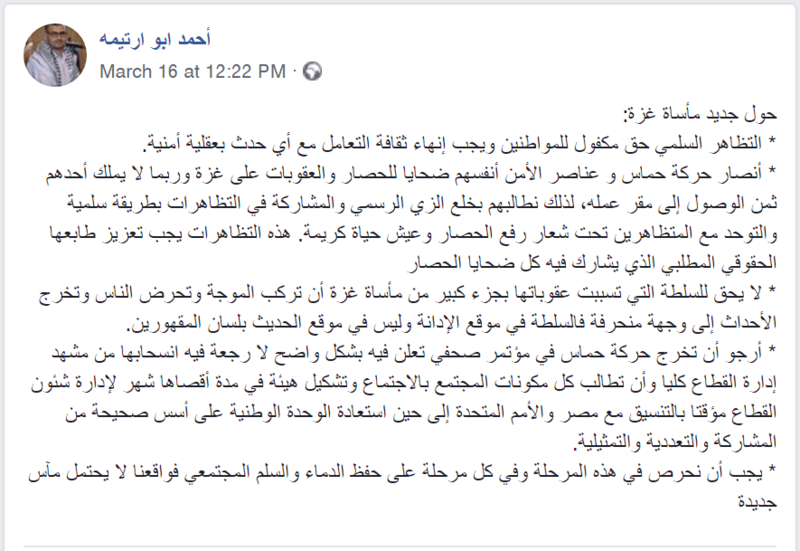 In Syria, Hamas did not join in with the PLO Return March and the Ahmed Jibril organization running them because it was already busy building an infrastructure for the next stage – after the Syrian Return March. Hamas, which had already established the first cells of what would become the Nusra organization in Syria’s Yarmouk refugee camp, did not want to be exposed. However, it saw with its own eyes how the demonstrations at the Golan border fence immediately spilled over into demonstrations against the Syrian regime.